Build-in rollers can be cleaned with our mobile laser system. A traverse is being placed with a laser gun attached. The roller needs independent driving during cleaning. 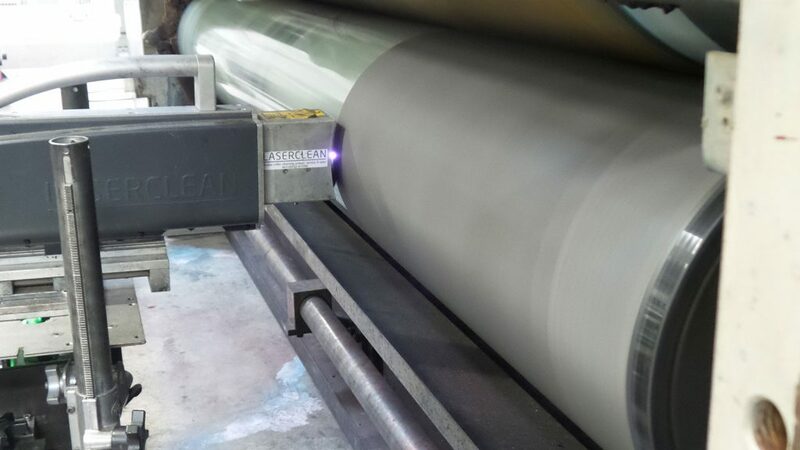 Even the longest rollers (3.5 meter and longer) can be cleaned, which renders this method especially suitable for the cardboard industry, where every removal and placement of large rollers costs time and bears risk for damaging the roller. Laser cleaning doesn’t bring extra dirt, and no water or chemicals are used. Mobile laser cleaning is a clean and practical solution. After cleaning the roller can be used right away. Frequently, removal of rollers or sleeves is not overly demanding, or spare rollers are available, providing for optional collection of dirty rollers. Laserclean then visits two or three times per year (or on demand) to clean these rollers. The cleaning is done in our specially equiped service truck. The truck contains a stabilisation system, hoist system, cleaning table with driving and a mobile laser unit ALCS 2500. Your rollers do not leave your premises and are deployable directly after cleaning.